If I had only 10 minutes to furnish a corner of a living room, this is what I'd choose. Maybe that's because I literally put it together in 10 minutes while Elin built a tower of blocks behind me and I knew I had to seize the moment before it was gone. Also, I've been looking to update some of our own furniture and am searching for the perfect lounge chair for the living room so I have a secret furniture wishlist as long as my arm. It's always an attempt to find a balance between what I want and what I know will work with two kids at home, so it needs to be durable and not too expensive or fancy because it will inevitably attract a stain or two (or a hundred). These lighter warmer tones in taupe to mole grey are my jam right now. After going through a major period with lots of contrast in black and white I welcome these more tonal looks and the softness they bring. I'm looking for that balance at home, slowly adding in items in paler shades and different fabrics. We have a lot of linen currently but a new fabric I want to try is velvet. It has this lux/vintage quality to it and I'd love to find a giant ottoman covered in this material. I also think knowing where to look or having trusted shops to go to makes such a difference. Locally we don't have great furniture shopping so I buy almost everything online. 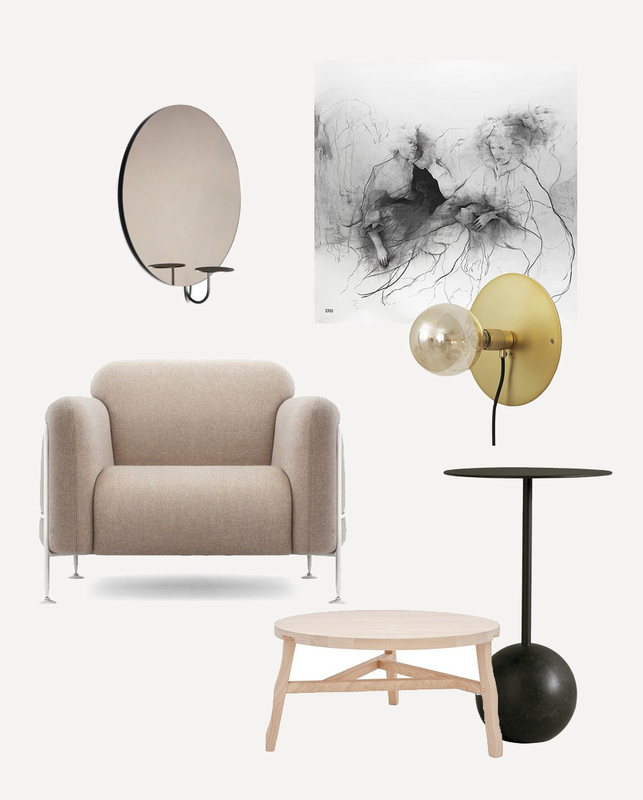 Recently I heard about a place called Danetti which sells more modern furniture if you live in the UK, but haven't tried them personally. In the States I really like A + R and MOMA, who has recently added a collection HAY pieces including the new outdoor line, Palisades. Globally I've also used Finnish Design Shop because they will ship even larger pieces to the US from Finland. Menu has also been a go-to as they have a US warehouse and stock a lot of the bigger items as well. What are some of your favorite places to buy furniture? We got this velvet ottoman recently for an insanely discounted price http://www.anthropologie.com/anthro/product/home-furniture-accent/F35459791.jsp#/ Ours is blue. It's massive and a nice change of color/texture from our normal neutrals and linen, like you said. It's one of the best purchases we've ever made, though it scares me to think about keeping it clean. I'm REALLY loving this corner you created and wish I could have it all.